You can order birthday cakes online or get in touch using the form below to enquire about a custom cake and we'll get back to you soon. Please use the form above to enquire about orders. You can also email us at cakeitforwardnz@gmail.com please include the details above. Please take some time to read through the terms and conditions below. By confirming an order with Cake it Forward you agree to our Terms and Conditions, as stated below. All products are created in a registered kitchen. To secure your date and confirm your booking, full payment is required at least two weeks out from your collection/delivery. Deposits are strictly non-refundable and non-transferable to other people or cakes or dates. Any changes within one week of the date required will incur additional charges. All cakes created will be photographed on our premises and at the venue if delivering. All photos taken are the property of Cake it Forward. We reserve the right to use the photos for advertising, on social media or our website. Please be considerate when picking up your cake. If you are going to be late, please contact us on 02102232997. Hours for pick up are strictly as arranged when booking. If you do not arrive at the agreed time and no contact has been made, your deposit will be forfeited and your cake no longer available. Cakes not collected after 24 hours will be sold, donated or given away. Cake it Forward accepts no responsibility or liability once your cake has left our premises. Instructions will be given for transporting the cake. If your cake suffers any damage after collection, we may be able to help rectify the situation. Please note charges may apply. Cake it Forward will take every care and make every reasonable effort when delivering your cake. 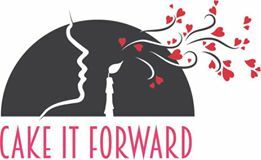 Cake it Forward accepts no responsibility or liability for acts of god and unforeseen circumstances. Cake it Forward accepts no responsibility or liability for the condition of the cake between delivery, display and serving of your cake following delivery. If you have a problem with your cake, please contact us as soon as possible. Thanks for caking with us.